SustainableWork: For startups to work, somebody's got to go down the hole. Entrepreneurship as spelunking. For startups to work, somebody's got to go down the hole. Entrepreneurship as spelunking. Entrepreneurship is harder work and far less glamorous that what you'll read. I'm always looking for ways to describe this subject. I think I found a good one in a recent article about dangerous caves and the people who explore them in the New Yorker magazine. The writer compared great caves to great mountains. "Everest was the world's tallest peak long before Edmund Hillary and Tenzing Norgay scaled it. But a cave is only officially a cave when people have passed through it. Until then it's just another hole in the ground." As a working entrepreneur for decades, I find myself in a world where people run around measuring holes in the ground and writing papers about where holes in the ground might lead, and - save us - getting grants to create theories about holes in the ground. But that's not the way it works. Somebody has to climb down into the hole and discover what's there. Until then it's just another hole in the ground. Climbing into those dark, muddy passages is daunting. You get stuck. You take wrong turns, you can get disoriented, or worse, get lost. Everybody thinks entrepreneurship is an exercise in climbing mountains and reaching for starry new heights. I like the idea that entrepreneurship is a series of dangerous steps taken into dark caves with the goal of discovering light. Every now and then, if you persist through the darkness and difficulty, a sparkling new cavern will appear that no one has yet discovered. Even better, the hint of more new unexplored passageways will appear and beckon. Entrepreneurship needs mountain climbing, but the reality is spelunking. 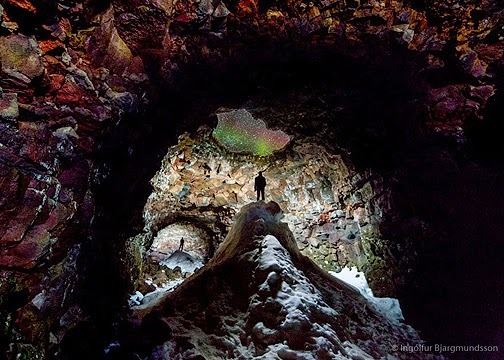 Photo is from NASA Photo of the Day - That's a blazing Aurora Borealis seen through a break in the cave ceiling. July 22, 2014.